I have included quite a few maternity items I purchased prior to this month. Since I am starting almost from scratch again, I am basically buying a new wardrobe and I need clothing for spring, summer, and fall. Some of my clothes will already work, but I need quite a few basics. This includes pants, a couple sweaters, tees, a few dresses, and shorts. A couple years ago I had done a year long collaboration with thredUP. I saved some of my credits specifically for maternity wear. I have also sent in bags of clothing I didn't want that added to the total. So I had (and still have some) several hundred dollars to spend. With their free returns, I have been taking advantage of anything I don't like or doesn't fit well and sending it back to get my credits back! I am thrilled to finally be using that money! So I just wanted to explain why I have so many things from thredUp c/o this month. I also got a pair of slip ons I had been eyeing. I am hoping they will be one of the shoes I take to Ireland later in June. They are pretty comfortable, but with extended wear, they do rub on my heels so I think I need to add a cushion or break them in a little more before we leave. Initially I was wanting the blush color, but it ended up being too close to my skin tone so I exchanged them for grey. Recently I have purchased some accessories because that is such a fun way to mix up maternity basics. I have a turquoise necklace and fun clutch on the way I will include in next month's post. I also have a pair of shorts from thredUp, 2 pairs of shorts from Old Navy, and a few more pairs of pants/jeans currently on their way. I know it seems like a lot of buying, but with maternity wear, it seems like you suddenly need many new clothes. This time around I am showing much faster so I need maternity clothing sooner, too. I've also noticed most pants have the belly band start quite low so most regular tops won't cover it. Then you need a maternity tank or top. But after this I am hoping to slow down on maternity purchases and being able to remix items I have. How were your purchases this month? So excited that you need to dress your bump now! Love everything here but that necklace is keeps catching my eye. What a statement piece! 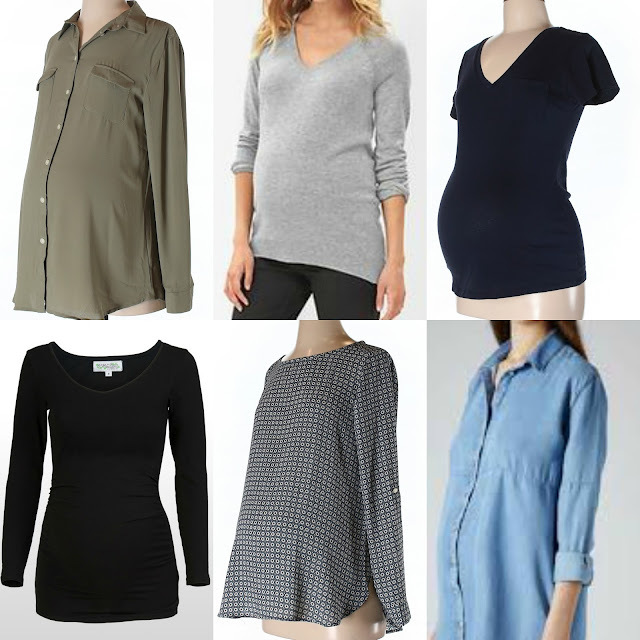 Your maternity wardrobe selections look like really great classic, staple pieces! Can't wait to see how you style everything! I love those slip on shoes, I'd love a pair in blush! I think you've done great adding to your maternity wardrobe without breaking the bank. I'm also in love with that gingham dress! So many great things. Those pink beads will be great to spice up your wardrobe a little! So many good items! Loving that blush top from SheIn. Looks like you got some great maternity things too. 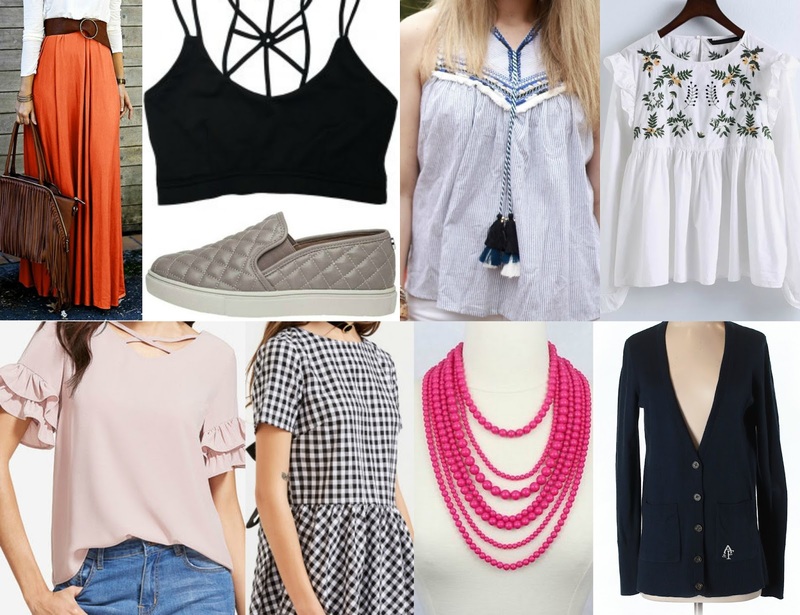 ThredUP really has a good selection.